PRA is a disease that causes the retina of the eye to degenerate slowly over time. The result is declining vision and eventual blindness. EIC affected dogs often begin to exhibit leg weakness followed by a complete collapse after just 5 to 15 minutes of strenuous activity. In extreme cases dogs affected by EIC can die. CNM is a muscular disease found in Labrador Retrievers that causes an awkward gait and a decreased tolerance for exercise due to muscle weakness. Puppies that are affected will never recover from this disabling disease. Hip and elbow dysplasia is an abnormal hip or elbow joint structure that is common in Labrador Retrievers. This causes severe pain with excercise and greatly affects the quality of life in a Labrador. CERF is an organization with a goal of elimination of heritable eye disease in purebred dogs. Veterinary Opthalmologist and determined to be free of disease. Retinal Dysplasia-retinal folds-If a Labrador retriever is identified with Focal or Multi-focal retinal dysplasia (retinal folds) during an eye examination by an ACVO diplomate, currently the dog is not eligible for certification within the CERF registry. In this case, the OptiGen DNA test will determine if the folds are caused by the mutation responsible for OSD. A NORMAL OSD result will indicate that the retinal folds are not caused by the OSD mutation and represent the frequent benign Focal/Multi-focal retinal folds found in these and other breeds. If the presence of Focal or Multi-focal retinal dysplasia (retinal folds) is not associated with the RD/OSD mutation, then the dog is considered free of a major inherited eye disease. Please note that these comments refer only to Focal/Multi-focal reitnal dysplasia (retinal folds). Geographic retinal dysplasia may represent a different, possibly inherited, disease. OSD is a severe condition in which the dogs show a variety of skeletal malformations, including shortened limbs (dwarfism), and blindness at an early age; the blindness results from a generalized malformation of the retina that causes a partial or full retinal detachment and cataracts. Chapter 3, Section 4A of the AKC’s Rules Applying to Registration and Discipline states the following: “Limited Registration may be requested for a dog when application for individual registration of the dog is submitted, provided the application, together with a request for such limitation, is filed by the owner(s) of the litter at birth. A dog registered with an AKC Limited Registration shall be ineligible to be entered in a breed competition in a licensed or member dog show. It is eligible, however, to be entered in any other licensed or member event. These events include: Obedience, Tracking, Field Trials, Hunting Tests, Herding, Lure Coursing, Agility and Earthdog. Limited Registration is determined by the litter owner(s). The litter owner(s) check the Limited box on the AKC Dog Registration Application. Limited Registration certificates are white with an orange border; the Full Registration certificate is white with a purple border. Limited Registration can be changed to Full Registration only by the litter owner(s). The litter owner(s) will need to obtain the Application to Revoke Limited Status. That form will then need to be completed and sent to our Raleigh address with the processing fee. After processing, we will send a Full Registration certificate to the dog’s owner. Limited Registration helps breeders protect their breeding programs. If breeders do not want puppies used for breeding purposes, they can request the Limited Registration option for those puppies. The American Kennel Club does not license or endorse anyone engaged in the commerce of selling purebred dogs and, therefore, has no control over the business practices of those involved in such transactions. Membership in the American Kennel Club is comprised of independent dog clubs located throughout the United States. No individual persons are members of the AKC. The AKC will not become involved in disputes concerning ‘full’ or ‘limited’ registration of a dog. These disputes must be resolved by the parties involved in the sale of the dog. The only exception to this is in cases where there is a contract, signed by all parties involved and made at the time of the dog sale that stipulates the registration status. In those cases, AKC will initiate an inquiry on the matter. Like most colors of Labrador in the earliest history of the breed, I’m sad to say the majority of fox red Labradors were culled at birth. 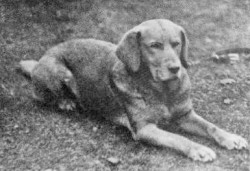 The Lab was a working dog used during hunting pursuits and the hunting fraternity heavily favored the Black Labrador over all other colors. And so red labs were relatively uncommon. But in a reversal of the trend today, in the early days of the breed the more common shades of yellow that existed were dark yellow to fox red. The lighter shades of yellow and cream that we think of as normal today, were actually quite rare. In fact, the first ever registered yellow was a dark golden color. Ben of Hyde, registered in 1899 and seen in the photograph to the left, shows he’s a relatively dark color and until the 1940s, this was certainly the norm. However, through the mid to late 1900s, lighter shades of yellow and cream became more fashionable and breeders sought to selectively breed for these colors. Lighter colored Labradors were rare in the early history of the breed. They stood out among the crowd and so they were more desired. This caused breeders to try to match the demand and selectively breed for lighter colors. This behavior eventually caused the decline of reds by actively ‘breeding the color out’. Due to a lack of popularity of the dark red coat colors, it all but disappeared. But this new-found rarity in turn made the darker red Labs more desirable. It’s they who now stand out against the lighter colored crowd in modern times. So now there are many breeders who are selectively breeding to try to obtain litters of reds to meet the demand of people who want the rarer color. Things have turned full circle.